There are many ways to describe Merlin James: artist, writer, critic, sculptor of strange little buildings, collector, occasional curator, a painter’s painter and even a writer’s painter. All of which are correct, but without a doubt Merlin James is a painter first. He is an artist concerned and engaged with the craft and language of painting; in this I am referring to the object that is painted and the language ‘vision’ that constitutes ‘painting’. Here these two aspects sit both easily and uneasily together in his works. Craft and language are ‘uneasy’ because James has chosen to use every possible means one can imagine in terms of picture production—acrylic, sand, linen, straw, hair, even holes—to exacerbate the surface. Look closely. They are not pretty. In fact the best way to describe the physical nature of his work is ramshackle. I say this only in the fondest of terms. There are holes, rickety stretchers, canvases that have been cut and restretched, accreted layers of acrylic in some areas, patches so bereft of paint that the canvas is exposed, and if you have the opportunity to see the back of some of them, the very occasional footprint. It is just this precarious nature of production that cranks up the tension inherent in each of these objects. In describing the stark landscapes of Carol Rhodes, James writes in the Scottish National Gallery of Modern Art’s catalogue of her 2007 exhibition, that these ‘paintings are heavy with the effort of their creation’. Most certainly the same words could apply to his own paintings. Holes in the canvas (he calls them ‘negative collage’), sticks that form windmills, pieces of twine or hay or hair that almost make shading, loud splats of colour, all serve to slow the eye. Each painting asks us to look hard and contemplate. It is not that such artists are rare, but our current art-fair-fuelled economy seems far too brash and slick to advocate or support this kind of contemplation. It is an art of interruption, rather than one of seamlessness like that of a Peter Doig or Gary Hume. James’ attempt at a more contemplative art is very much tied to tripping the eye, both in terms of subject and object. Ease is not a trait that he is after. It is not meditative like that of Rothko or Reinhardt, but a somewhat more intellectual endeavour, albeit reached via haptic means. In this regard he has chosen a very complex path; painting and representation constantly grate against one another. 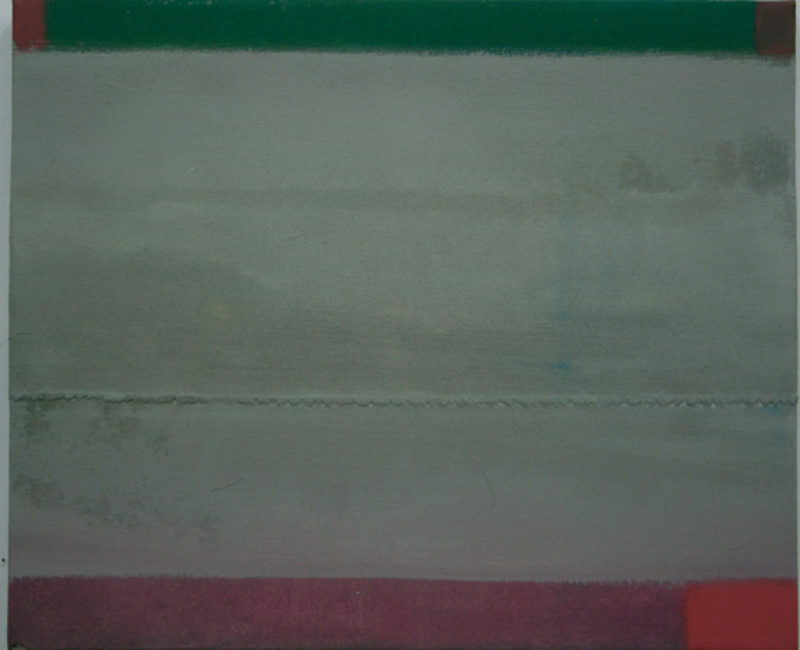 Formally, this approach echoes the chance and openness adopted by Raoul De Keyser, another artist he has written about. In his writings and curatorial projects, he supports highly individualistic artists: Alex Katz, Jean Hélion, William Nicholson, Giorgio Morandi, and among his contemporaries, Clive Hodgson. But in the last few years it has been Serge Charchoune (1888-1975), a Russian-born, Paris-based painter, who has caught his eye. A painterly painter with a light gestural touch, whose career spanned the arch of modernism, like many of the individualistic talents of that century, his oeuvre incorporated some of its developments without committing to any specific movement or school. In fact, this artist alternated between abstraction and representation, as we could say James sometimes does. During his Mummery+Schnelle exhibition, James is also organising a small group of Charchoune’s paintings in the rear gallery. In the final week, Charchoune’s work will multiply and take over the entire space. 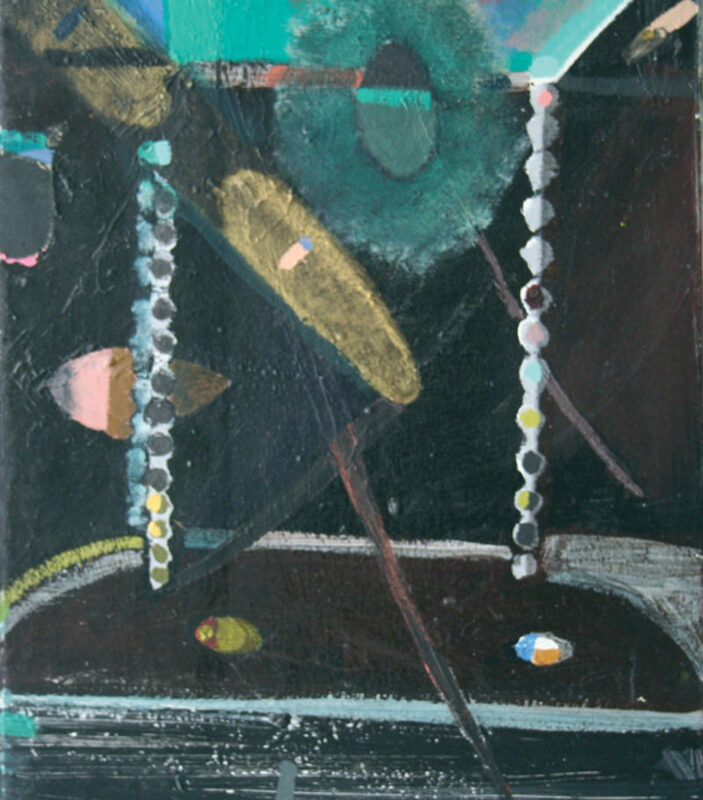 James has described this relatively unknown painter’s work as both ‘abstract and figurative; he never lets us forget the synthetic means by which he creates visual meaning and mood. Thus he achieves a wonderfully unself-deceived affirmation. He said, knowingly, ‘Je suis incorrigible, je suis sentimental’. 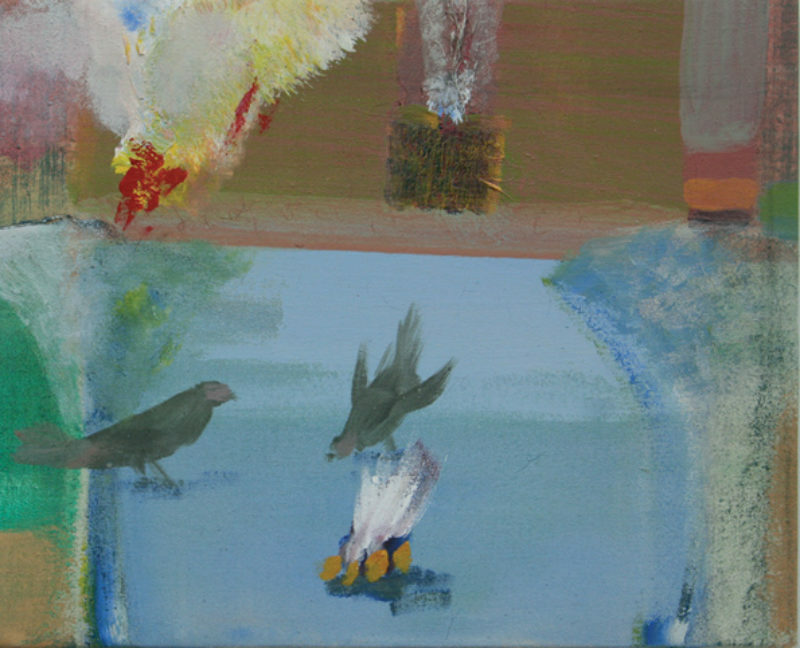 James’ own paintings are wonderful in their sentimental unsentimentality. Sentimental with an open love of painting and all its history. Unsentimental in their treatment. All executed with a passion for paint. Each work revels in the history of painting, advocating its formal nature and subject matter, without directly quoting its lineage; he is not a postmodern artist. Perhaps we could describe him as a history painter, not a painter of history, rather one who is actively involved in the history of painting itself—reinvesting it with meaning and purpose. For example, his seascapes directly recall Courbet’s paintings of the same subject, a process he has described thus: ‘I’m very interested in how we know when a painting is made, where it was made, how immediately is that part of our response to a work. Our attempt to place it historically; what’s going on, what do we do with that…’ It is an interrogation into what constitutes a painting. What is so admirable about James’ endeavour is that each work asks one simple question: how to make paintings today that are not ironic, that are not driven by theory or politics or sociology; that are not mere glib representations; or facile jokes. He is working at reinvigorating painting by making paintings within its own language and structure. Perhaps ‘experimental’ is the word to use in this context, as if painting acted as his laboratory. ‘I try to make new meaning’, he has said of his work. And like De Keyser, every element of risk is there to be seen, incorporated into the slow process of production. ‘Uneasiness’ is probably the word that best describes James’ results. He himself has said that there ‘is anxiety in my work’ (Vitamin Arte Contemporanea catalogue, 2005). Not dread, nor fear, but unease. Perhaps some angst. This is manifest both physically and in the subject matter. 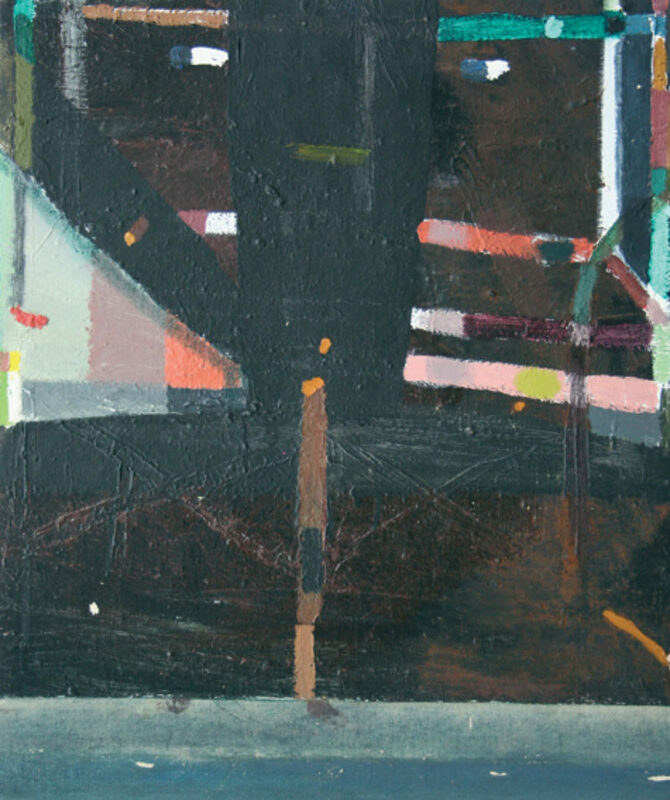 In combining the sentimentality of painting, a medium rich with history, with the rough and tumble avenues opened up by modernism’s exploration into its formal nature, James has arrived at objects that are shakey, yet full of joy. The New York critic, John Yau has described them as ‘intensely mournful and powerfully tender; they embody as well as depict the deep solitude and longing that haunts us all’. Modernism has generated so much bombast, so much ‘shock of the new’ art, that easel painting, enduring as it does today, seems displaced and unradical. In fact the idea of it seems pre-20th century. In a short text in the Talbot Rice Gallery exhibition catalogue of 2004, James makes the following statement. Not quite a manifesto per se, but certainly an act of rebellion in our current economy, and an idiosyncratic call to arms: ‘The works in this exhibition are in the tradition of Western easel painting. Easel paintings are usually rectangular, of small enough proportions to be fairly portable and hung on walls for viewing. They are admired for their formal interest and beauty; for how they address the viewer’s wider experience in the world; and for their particular contribution to art in their field’. I am not suggesting that James is a painter with a programme or conceptual superstructure, rather by the act of painting he affirms the activity of easel painting. Every stroke is an affirmative gesture, yes! yes! YES!